Two people have been rescued by Howth RNLI after their 48ft yacht started to sink off the coast of Dublin. Howth RNLI launched their all weather lifeboat this morning after receiving an alert at 8.24am that there was a sailing vessel with two people aboard taking on water and starting to sink. The all weather lifeboat launched at 8.33am and located the casualty vessel seven miles east of Howth with two people aboard. Two lifeboat volunteers went on board the yacht with a high powered water pump. The lifeboat took the yacht under tow to the safety of Howth Marina. The wind was Force 5 westerly and the sea state was a metre a half swell at the time. "The two people aboard the yacht were in good spirits and thanked the RNLI for their help," the RNLI said in a statement. 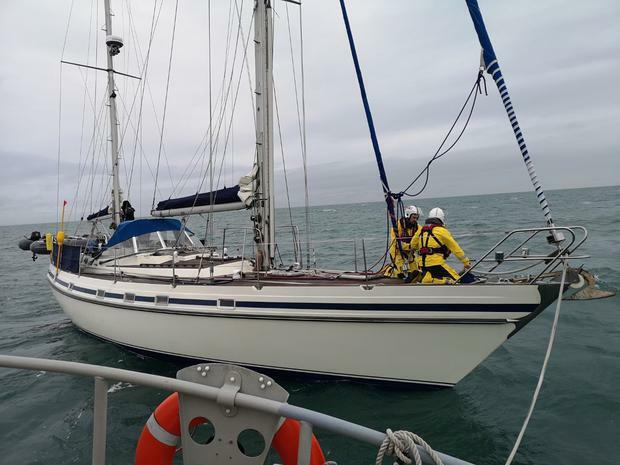 Speaking following the call out, Ian Sheridan, Howth RNLI deputy Coxswain said: ‘We were delighted to be able to launch so quickly and locate the sailing yacht fast enough to be able to save the vessel from sinking and bring them back to the safety of Howth Marina. "We remind everyone going to sea to always respect the water and always have a means of communication aboard. "The casualty vessel in this instance was able to make immediate contact as soon as they discovered a problem and we were able to act accordingly."